High, nasal “yank-yank-yank;” resembles tooting of a tin horn. 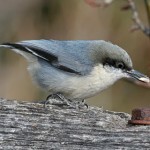 Description: Blue-gray above; black cap and eye line; white eyebrow; rusty breast, belly, and undertail coverts. 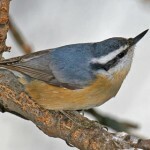 Females and juveniles have a duller head and paler underparts. Habitat: Found in coniferous forests, conifer plantations, and mixed woodlands. Also appears at feeding stations during winter. 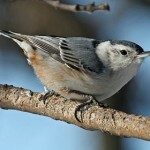 Where in Nebraska: Common winter visitor in eastern Nebraska and the Pine Ridge area. Generally uncommon elsewhere in the state. Possible breeder in the Pine Ridge. Field Notes: Tends to be an irruptive migrant, with numbers and winter range varying widely from year to year. 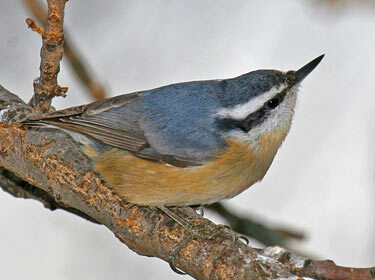 Fun Facts: Red-breasted Nuthatches hoard excess food by wedging nuts into bark and then hammering it in with its bill.